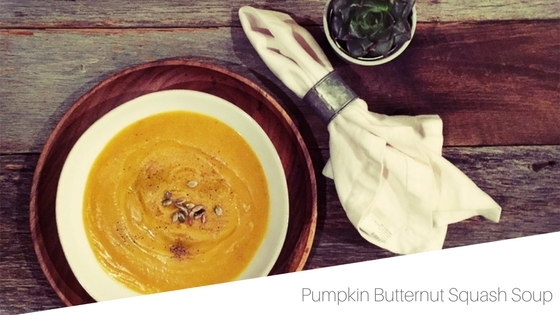 Bake your butternut squash, preheat oven to 350. Cut squash in half, remove seeds and place in baking dish, cut sides facing down. Pour 1inch water into dish around squash. Bake until tender for about 1.5 hours. Same if you are using fresh pumpkin. When finished remove skin and cut into cubes. Once squash is finished add all ingredients (minus the pumpkin seeds) to a blender (may need to batch) or into a soup pot if you are using an immersion blender. Blend until puréed, heat to desired temperature and enjoy. Top with toasted pumpkin seeds. Serving around 4.